I’ve said this before: I’m a lazy guy, and yet I’m a perfectionist. I want my cocktails perfectly-prepared, but I’d really rather not work too hard. With that in mind, I present my latest in perfectly-prepared cocktail ingredients for slackers like you. A couple of years ago, like so many other bartenders around the world, I implemented a daily punch program at my bar. It’s been well received by our guests, who enjoy exploring a different, interesting and inexpensive tipple every night. And my staff loves it, because it’s a drink that can be poured and handed over to the guest in absolutely no time at all, but provides a daily conversation piece to interact with the folks across the bar. One of the key components to a classic punch, as we learned from our friend David Wondrich in his book Punch, is a proper oleo saccharum. The process involves peeling citrus (usually lemon) and gently muddling it into superfine sugar, letting it rest for an hour or more. I always recommend stirring the mixture occasionally until the sugar essentially melts from the citrus oil as it leeches from the peels. What you’re left with is a sweet, aromatic base for a tasty bowl of punch. If only there were a quicker way to prepare oleo saccharum, a method that didn’t require any stirring or tending, a method that could be prepared ahead of time without fear of spoilage or evaporation, so that a delicious punch could be prepared quickly by anyone with a recipe. Here’s our solution: superfine sugar and lemon peels are immediately placed into a vacuum seal bag and sealed. 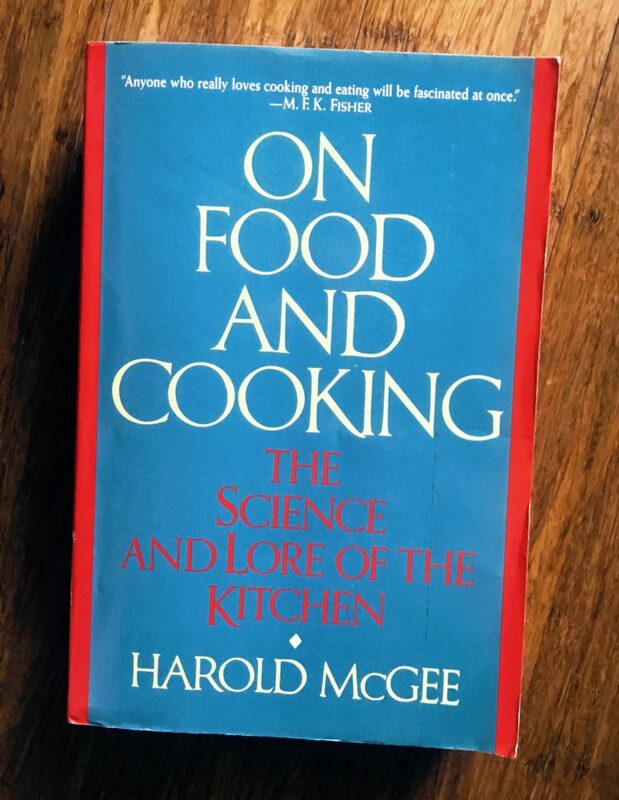 Over the course of four to six hours, the lemon oils in the airtight environment leech out and perfectly dissolve the entire mass of sugar, without any need for a watchful eye or constant agitation. Once the process is complete, the bags are dated and refrigerated, and ready for use. We prepare a week’s worth at a time, and the last bag is every bit as fresh as the first. We use the inexpensive FoodSaver vaccum sealer ($50 on Amazon), and quart-sized bags ($20 for 44) at our bar. One of our favorite punches from David’s book is the classic Philadelphia Fish House Punch, updated with his kludges, and re-updated here using the vacuum seal oleo saccharum technique. Place sugar and lemon peels into a vaccum-seal bag and seal according to the manufacturer’s instructions. Let rest at room temperature for four hours, or overnight, until the sugar is soaked in lemon oil. When punch is ready to assemble, pour contents into an eight-quart container and add the rest of the ingredients. Makes approximately 5½ quarts. Very cool, and the punch sounds incredible. I had no idea Food Savers had gotten so cheap, I’ll have to get one and try this. If this works it’s a brilliant idea! I will try it myself and let you know if it works. Thanks Jeffery! what do you do with the lemons? my experience is that the juice from zested lemons is (unsurprisingly) bitter. i can reduce the bitterness by scrubbing them under cold water first, but it doesn’t completely go away. any tips? We juice the lemons, I’ve never noticed any unpleasant bitterness from a peeled lemon. Honestly, there doesn’t seem to be any reason why you should need to scrub them under cold water, but maybe I’m missing something here? I love the punches you make at the Clyde. I drank a few glasses yesterday. You are seriously on a roll right now, My man! Really great stuff, please keep it up! Thank you, I love this. Listen, I wonder if these sacks of goodness could be frozen. 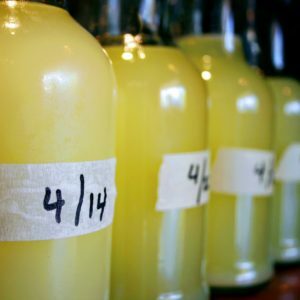 Could I do partial batches of this in advance when we get the good lemons and then keep them frozen for use throughout the year? I will scale down and try this recipe, I appreciate your having shared it. It’s possible, but I can’t vouch for the texture of those lemon peels once they’re defrosted. You very well might end up with a punchbowl full of lemon mush, I really don’t know. You may be “lazy”, but you are a remarkably talented and productive bartender. Great procedure, thank you for sharing! As always, an amazing tip!!! 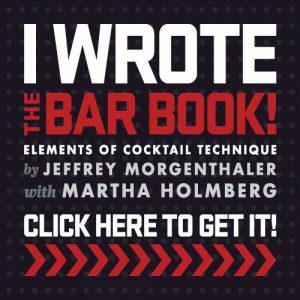 Thanks so much for the blog, it has literally transformed my interests and abilities re: cocktails. Thanks for the kind words, Josh. 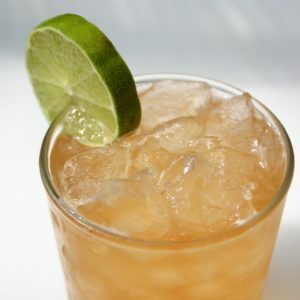 Here’s another from David Wondrich that we use all the time, the Garrick Club Punch. The only slightly obscure ingredient is maraschino liqueur. Try it out! We´ve been doing something similar to make vanilla syrup, just need to add some water to the mix. 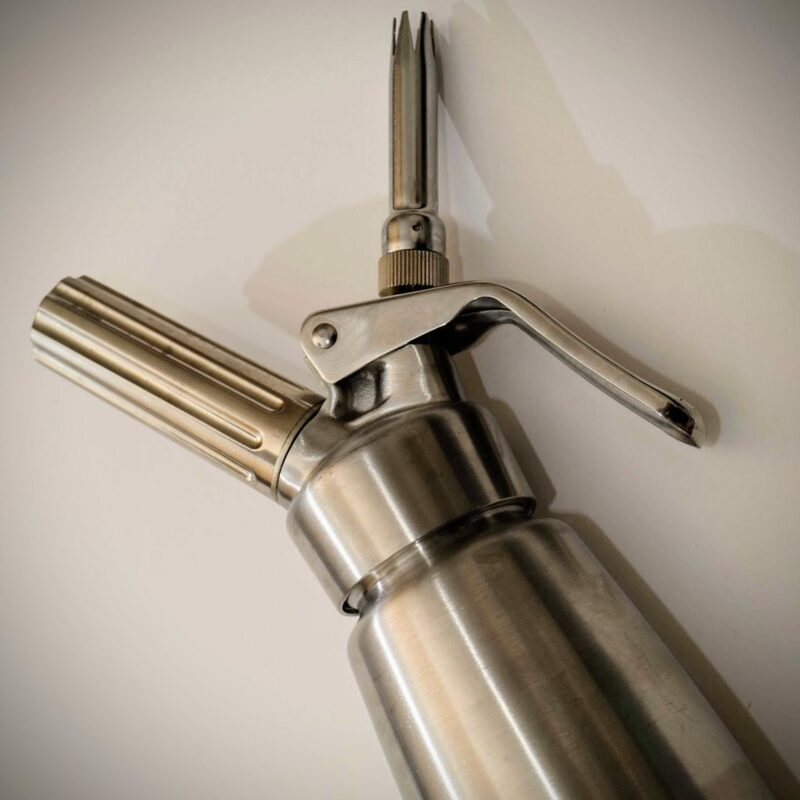 We do heat it in a sous vide, but a bain marie would probably do the trick very well. The flavor is VERY intense. Great tip! Made some at the bar last night. It was cool to watch the transformation take place. When making a punch do you add the entire contents of the bag, peels and all? Cheers and thanks for the inspiration!! Kurt – Wondrich says that the peels are optional; you can leave them in or strain them out. Personally, I like to leave them in and make sure I ladle one into each punch glass when serving. But that’s just me. Hi Jeffrey. I’ve been toying around with making the recipe for the cocktail hour at my wedding this may. I was wondering about how many servings you get out of each batch? If one can’t procure peach brandy is there a reasonable substitute to use? I just wanted to qualify my last statement – when I said “pricey” I just meant in a general sense. Their peach brandy is a great product and worth every penny. Great Lakes is a wonderful distillery and it’s very nice having them in my backyard. 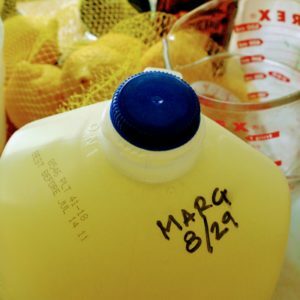 Also, Mike – the recipe notes that it will make about 5.5 quarts. Thanks for the reply. Ooops, I meant liqueur, not brandy. I don’t have access to the Great Lakes Distillery peach brandy but I can get some Marie Brizard peach liqueur. Can anyone vouch for it? Will it do in a pinch? I’m late to this post, but can you clarify which Applejack you are using? There’s Laird’s standard Applejack (which is grain neutral spirits with apple flavoring), Laird’s 7 year real Apple Brandy, Laird’s Bonded (real Apple Brandy too), and a 12yr old Apple Brandy as well. I would appreciate any help as I’m going to make a batch next week. I had to comment on that punch, I tried it last night and it is simply great, recommended for those that have yet to try it! Glorious. I have done this numerous times now and it makes life so much easier. And tastier. This is great. Need a little follow up advice if you don’t mind. 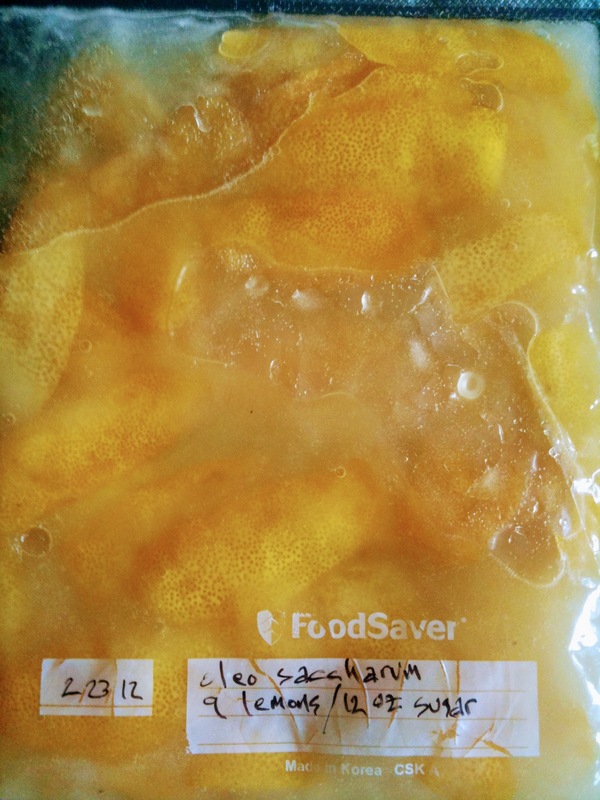 I made Oleo Saccharum for the first time ever, using this method. However I wasn’t sure if what I got was correct. After a day in my warm dry store I had three components in the bag. One was a clear yellow smooth oil, one was a lot of partly dissolved sugar smush, and the lemon peels them selves. Should I combine these three things and use as a whole or do I only want part of it? Or did I do it completely wrong? Keen to learn more about this. Jeffrey, I saw your method and used it to make my first punch requiring oleo saccharum (I bought a Caso Smart Vac 20 vs. a Food Saver). It worked fantastic, thanks again for the great tip! And I highly recommend Derek Brown’s Pickin’ Punch recipe from Dan Searing’s book, The Punch Bowl. I’m wondering about using something like this as a citrus-flavoured simple syrup in Old Fashioneds and so on. Does anyone have any thoughts on that? The peach house punch recipe here is very smart. The smith and cross for funkiness, the appleton for cost management, applejack + peach liqueur for availability. I’ve made the FHP several times for gatherings and special occasions and this is probably the best adaptation I’ve seen. Bravo, sir. Have you tried grapefruit? I was thinking it was possible that it’d come out TOO bitter. FoodSaver V2244 my first FoodSaver product and I love it. I find that I primarily like making my own bags using the rolls or FoodSaver packaging materials. I’ve sealed various meats for the freezer, as well as sealing breads, cookies and jerks. This unit does a great job vacuum sealing. Some reviews recommended double sealing but I did not find this necessary. Cleans easily in case of spills. Has sealed right every single time I’ve used it. Hello there! That’s a fantastic idea, I was wondering if it is possible also to do regular simple syrup? Just add the water, sugar sealed and let infuse?? Thx in advance! I mean, I guess? But would that solve some sort of problem with using a stove or microwave? 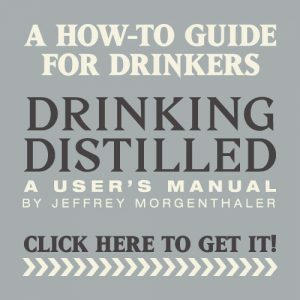 Hi Jeffrey, thanks for the reply, the goal of doing “vacuum simple syrup” it’s for save time, thinking in a bar context. Instead of heating and cooking the syrup, just add sugar water seal and let rest overnight, so maybe my bar back can do other things. Do you think can be a good idea? Have you maybe some pratical suggestion? Thank you so so much!! If you’re making 2:1 simple, which you should be, the sugar won’t dissolve with time alone. You’ll need to apply heat anyway. Even if I make a 1:1 simple syrup? My thought was if I just combine sugar water in 1:1 ratio by weight, seal and let infuse let’s say overnight, this could speed up not only the making process of my syrup but also improve his shell life? Thank you so much Jeffrey! Well if you have to leave it overnight that’s not speeding up the process at all. Applying heat is what improves shelf life, not using the cold process. But it sounds like you really want to use 1:1 simple syrup and that you don’t want to heat it, so I say go nuts. It’s just not what I recommend.